A loan of $10,000 helped build a wood-fired bread oven on our new farm. This will allow us to generate revenue as we continue restoring the property, the dairy, and working toward our goal of being able to devote ourselves fully to farming to benefit and nourish our community. Dan and Kim’s story starts with a love of good food and continues with the challenges of farming. Growing up in Lake Carmel, NY, surrounded by a family heritage of Italian and Puerto Rican cuisine, Dan was exposed to good flavors early on. Kim grew up in Beacon, NY and spent several years in Griffith, Indiana where her father worked at the family owned and operated Patty Cake Bakery. Being both semi-accomplished cooks and foodies in their own right, Dan and Kim’s inquisitive nature led them to look into producing their own food and farming. What started mainly as a curiosity in self-sufficiency and homesteading, ended up exposing them to a wider world of farming when they decided to pasture raise chickens. All it took was 25 hens and the seeds were sown. They knew at some point they would want to try their hand at full-time farming. Dan and Kim spent several years living abroad in Norway where they were extremely fortunate to be able to travel and get some hands-on experience. They volunteered on a farm milking goats and making chevre in France. They learned to make artisan breads in Tuscany with Carl Shavitz. And they also spent time assisting farmers in Copenhagen with Icelandic sheep during the lambing season. Based on these experiences they decided to return to New York to find a homestead to farm. They felt that the “best of both worlds” approach would be to combine a love of place with their passion for artisan fare. After an exhaustive search for land, they found an old farm to call their own and have begun the journey of starting a small farm from scratch in the fertile and bucolic Champlain Valley. There are still a lot of steps and challenges ahead, but their vision is to create an eco-minded farmstead that provides local food that mirrors the wild and natural beauty of the Adirondacks. Triple Green Jade Farm is a small organic farm comprised of 80 acres of gently sloping pastures that border the Boquet River in the Champlain Valley. We are a family-owned business that is dedicated to providing the Adirondacks (and beyond) with hand-made bread, artisan cheese and craft beer. The farm was abandoned for roughly 20 years prior to moving here and renovations were started in late 2014. Our biggest challenge has been in bringing the farm back to life. More of a marathon and not a sprint, we’re committed to what we will produce and looking forward to the kinds of gourmet experiences we can create for our customers. Our farm plan is based on three main operations: artisan bread, a cow and sheep dairy and a farmstead brewery. With a flour mill relocating to our town, and with the experiences Dan has gained growing organic wheat at the Cornell Research Farm this Summer, our main priority is building a masonry wood-fired oven to bake hand-made artisan bread using local and organic flours. Farm stays, agro-tourism, farm to table dinners, a tasting room, and pizza nights are the kinds of events and activities that we would offer on our farm centered around the bread oven. From grain to bread and from grass to milk, we’re committed to practicing sustainable and organic methods in every aspect at our farm. This loan helps us purchase the materials needed to build a wood-fired masonry oven and hearth which includes items like medium-duty firebrick, refractory mortar, thermal insulation, cement blocks, and more. We've factored the cost of the oven materials to be around $5,000. We've estimated a little on the high side to be safe. The other $5,000 allows us to get the materials needed to house the bakery. Using rough-sawn and locally-sourced lumber from a sawmill nearby, we will build a timber framed, rustic structure that will allow us to bake hand-made breads all year round. Our business will essentially be "launched" when this bread oven is completed. So it's super important that we get it built! With a local flour mill nearby, we've always felt that bread should be the first product our farm offers. 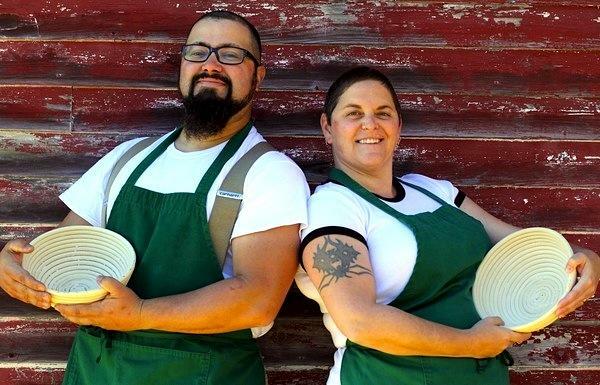 We strongly believe that the income gained by offering wood-fired sourdough and other hand-made breads will in turn help fund other farm operations, like renovating the dairy and milking parlor in the barn at Triple Green Jade Farm. Having a unique product that is in demand, the farm will start to generate income on it's own. Working off-farm will decrease and we will be able to devote ourselves fully to our farming goal: to live life in the service of others and nourish the community. Why are you endorsing Dan? Dan is a thoughtful, smart guy who is committed to building a sustainable farm that will become a great asset to the Champlain Valley community around him. He is the kind of person who is always learning, always taking in new ideas and figuring out how to apply them to his farm. He is being very strategic about how he develops the farm, minimizing his need for income so that he can invest as much as possible in developing his business.